Inaction to confront and reduce the risks of ongoing climate destabilization is bad fiscal policy. That is the message coming from the International Monetary Fund, the world’s leading fiscal rescue institution. The IMF deals with countries in default, or whose fiscal solvency is so delicate as to verge on catastrophe. In late 2013, one island nation saw 15% of annual GDP wiped out in 3 hours of unprecedented rain. Such sudden, unpredictable impacts make reliable fiscal policy planning impossible, because the value of any one dollar of spending or investment is so destabilized. Dislocated climate patterns are leading to a decrease in grain production and food security in some regions. The southwest of the United States, including much of California, is thought to be entering a period of unprecedented “superdrought”. We are now facing the very real possibility that staple food crops could be disrupted in California, the Great Plains, Brazil, the Andes, China, Southeast Asia, Kazakhstan, the Russian steppes, Central and Western Europe, and the Middle East and North Africa, all at once, even as population continues to expand at historic rates. Climate disruption has serious fiscal ramifications, because inaction to mitigate the threat is creating what might be called a “double distortion”. “Distortionary” policies interfere with a market’s ability to tell the truth about cost and value. For instance, a high tax on low to mid-range wages suggests there is no value in creating the kind of jobs most people depend on, yet an economy in which most people cannot earn a living quickly grinds to a halt. Such would be an example of fiscal policy provoking market failure. Already, the underlying fiscal structure is distortionary. Climate fallout is a cost no one is accounting for, because our fiscal policy infrastructure was designed to propagate behavior (the use of carbon-emitting fuels) that adds massive hidden costs to everything in the economy. Taxing economic benefits instead of practices that erode the resource base makes it more difficult to slip out of escalating inefficiencies. The IMF report finds that “many countries raise too much revenue from direct taxes on work effort and capital accumulation and too little from taxes on energy use.” It also specifies that “many countries, far from charging for environmental damage, actually subsidize the use of fossil fuels.” The double distortion comes when fiscal policy makes it easier to move capital into business activities that exacerbate the hidden costs. Not only does the failure to price degradation of natural systems add distortionary impact to our economy, but so does the direct delivery of taxpayer dollars to facilitate that degradation. As climate impacts mount, the inefficiency of our investments accelerates. Increasingly unmanageable impacts drain enough value to make it difficult to price anything, even money itself, accurately. To have a secure economic future, rooted in sound and resilient fiscal policy, we need to move forward with carbon pricing. This is true not only for the biggest polluters past and present, but for all nations. 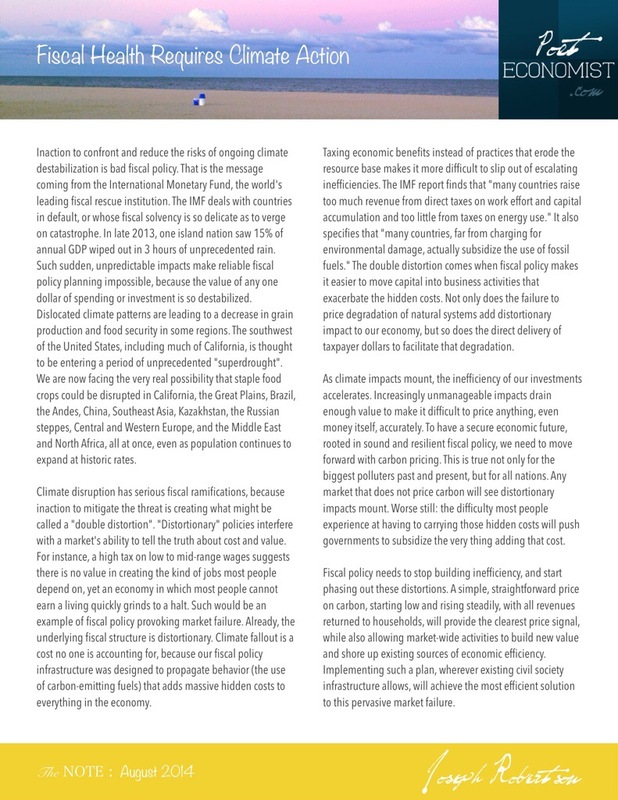 Any market that does not price carbon will see distortionary impacts mount. Worse still: the difficulty most people experience at having to carrying those hidden costs will push governments to subsidize the very thing adding that cost. Fiscal policy needs to stop building inefficiency, and start phasing out these distortions. A simple, straightforward price on carbon, starting low and rising steadily, with all revenues returned to households, will provide the clearest price signal, while also allowing market-wide activities to build new value and shore up existing sources of economic efficiency. Implementing such a plan, wherever existing civil society infrastructure allows, will achieve the most efficient solution to this pervasive market failure.